Browsing through the illamasqua collections on the website, I found The Naked Strangers Collection. The look is very heavy and not for the faint hearted, as most illamasqua collection shots are. 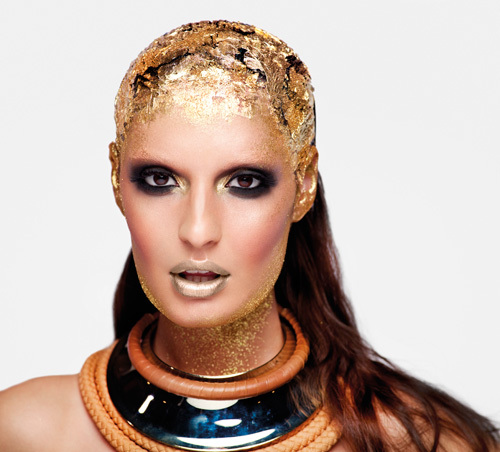 The focus of the images are metallics, and the statement sheath of gold running from the forehead into the hair has the vibe of an alien. The contours are so beautiful, her cheekbones look so flawless. I love the heavy eye makeup, although I doubt that I would wear it on a regular basis. The model looks so ethereal in this image and I especially love the nails. The look of 'claw-like' nails are very popular at the moment in the world of beauty and very popular on youtube. I'd love to do a wearable look based on these images, as gold is a workable colour that adds a sun kissed look to any skin tone.